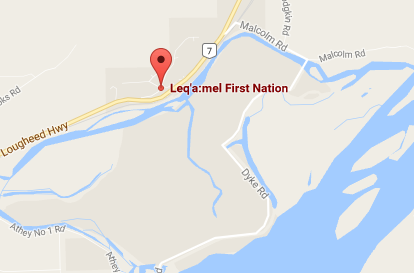 Leq’á:mel First Nation is located 22 km east of Mission, BC and 25 km west of Agassiz BC. 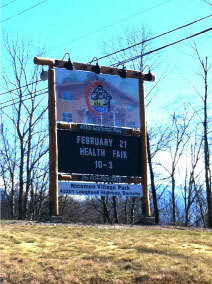 There is message board by the Leq’á:mel Way entrance. When travelling East-Bound on the Lougheed Highway, LFN is 3 km past the Deroche General Store. It is a left-turn off the Lougheed Highway on to “Leq’á:mel Way.” Turn left at the mailboxes, road will lead to band office. When travelling West-Bound on the Lougheed Highway, LFN is 8.8 km past the Sasquatch Inn. It is a right-turn off the Lougheed Highway on to “Leq’á:mel Way.” Turn left at the mailboxes, road will lead to band office. Should you utilize a GPS or map application to search directions to our building, and our address does not register, please type in: 43201 Lougheed Highway, Deroche, BC. This address will provide you with correct directions to our facilities.